This lovely valentine banner that is made with scrapbook paper was one of the first projects that I posted three years ago. It’s still one of my favorites. It’s made with heart shapes that look like lace, scrapbook paper cut into pennant shapes, and some twine to hold it all together. It was so easy and quick to make. I think it adds a pretty Valentine’s Day touch even if you’re not a big fan of bright red Valentine’s Day decorations like me. 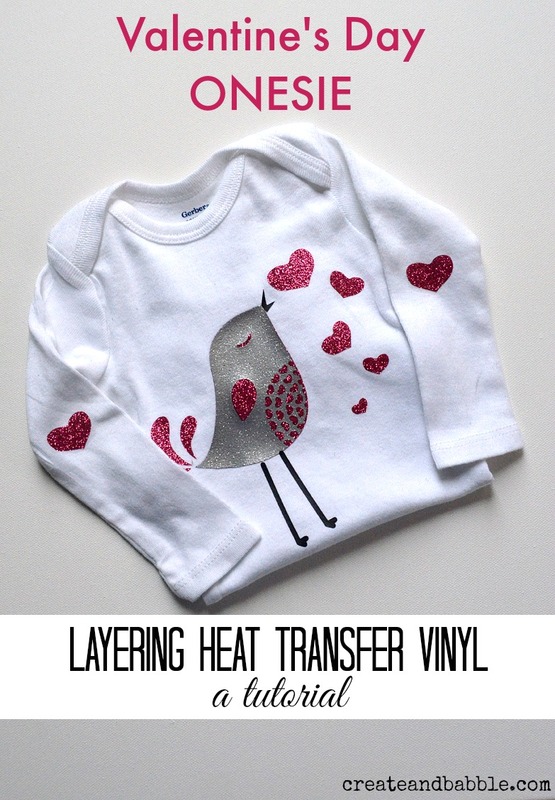 Who says Valentine’s Day decorations all have to be red! 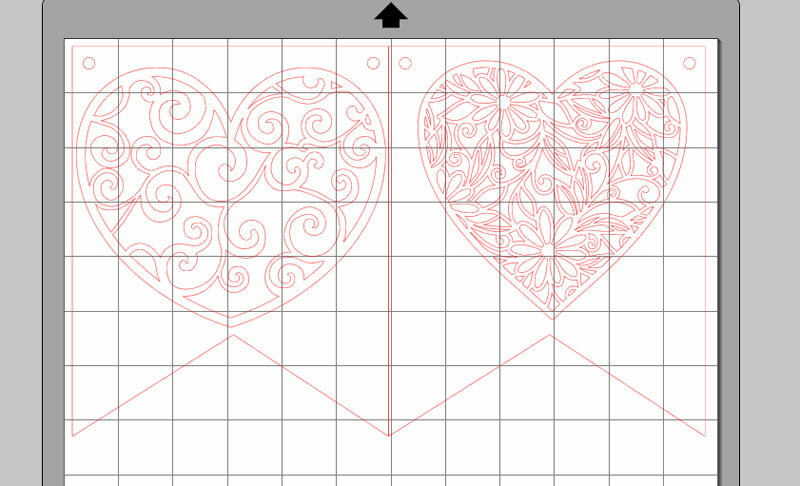 I used my Silhouette Cameo® to cut the heart and pennant shapes, but it can be made without one, too. If you’re using a Cameo, make the banners using any banner shape you like and adjust size to your preference. I cut my banner shape from scrapbook paper that is designed to look like a page from an old book. If you’re not using a Cameo, simply cut rectangles out of scrapbook paper, to the size you want and notch out the bottom (upside down “v”). 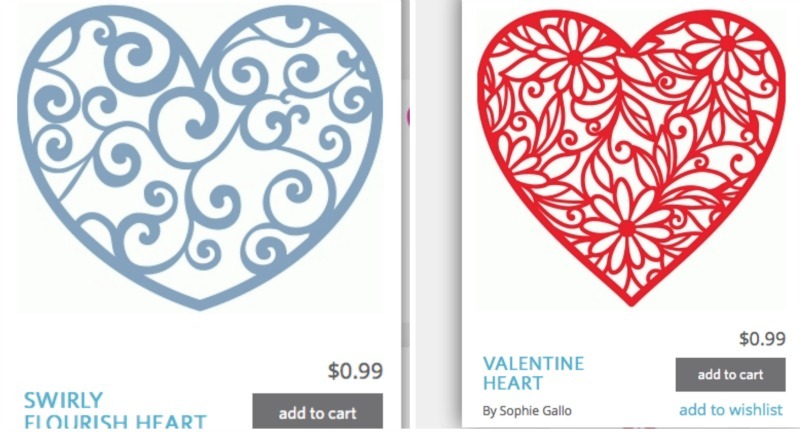 For the hearts, I used designs I found in the Silhouette online store (pictured above), but you could also cut out heart shapes from paper doilies. I used a spray adhesive to adhere the hearts to the banner shapes, then strung them together with twine. Since I don’t have a mantel, I displayed my banner across the bookshelf in the family room. Tell me, do you decorate for Valentine’s Day? I must admit that pre-blog days I did not. But it is kinda fun to hang a little something. If a banner is not your style, then you might like this wreath. 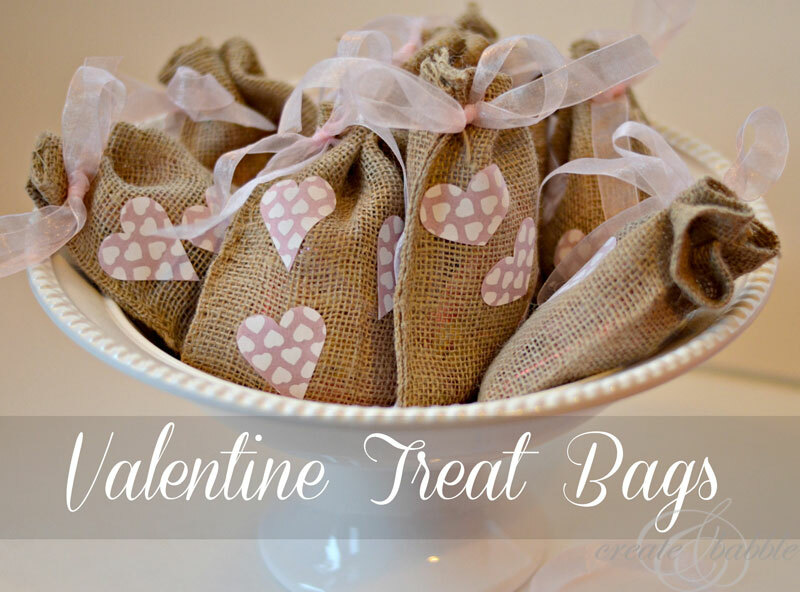 or maybe Valentine Treat Bags. I love this sweet Valentine’s Day Onesie! You have the most original ideas. Love them all. Darling! I love the delicate lacy look of the hearts. I too love using old book pages and sheet music for my crafts. Could not see where to follow you. Jann, I just added an email list. I hope you sign up! What a beautiful banner, it looks lovely! 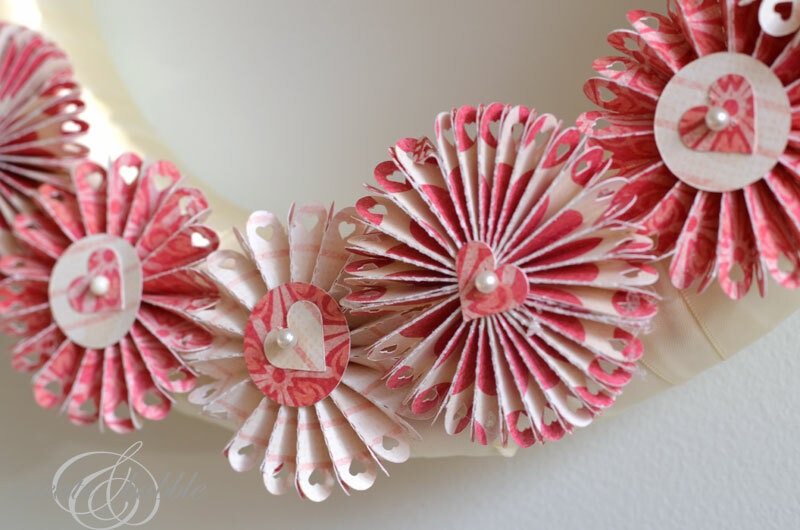 I love the paper, and love the hearts! It looks beautiful! What a lovely idea. 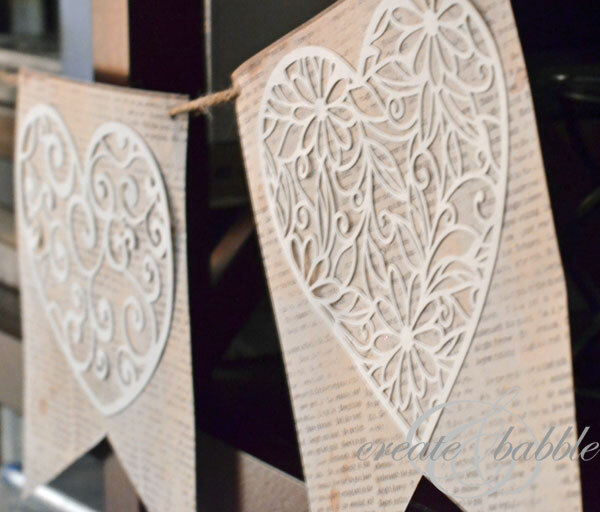 This would go very well with my heart burlap love note pillows! Such a lovely banner. 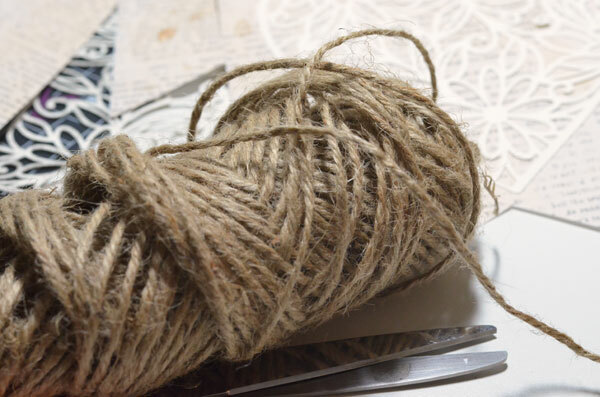 It looks so vintage with that particular paper & the twine. Cute! Thanks for linking up! I just LOVE your banner!!! 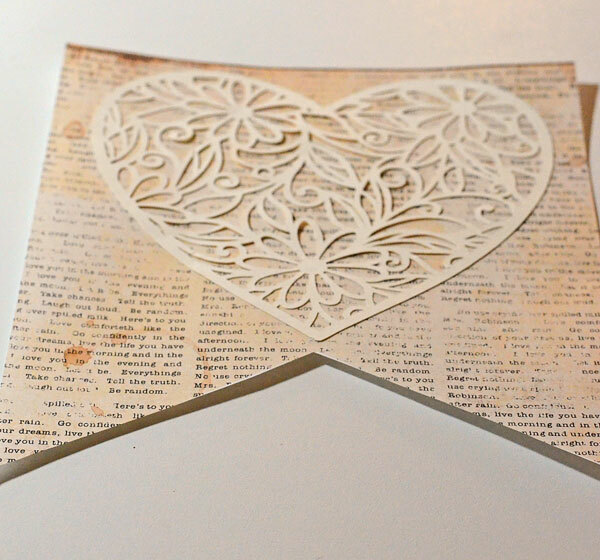 I always love projects that incorporate pages from old books or sheet music. I’m really honored that my “LOVE Banner” was included in the Silhouette “Valentine’s Day Round-Up” along with your beautiful shabby-chic banner!!! Thanks Joyce! It’s so nice to see this group really supporting each other! Wow! This is gorgeous! I love the paper colors your chose. Definitely want to make one of these for my mantel. Thanks for sharing with us at Merry Monday this week! These ideas are all really pretty and quaint. Love the banner. Great staff!! Seems like so easy now. February already came, Valentine is knocking at the door! Your special tips will really help me in making a beautiful banner!